Dr Pepper Snapple Group (DPSG), unsurprisingly, owns the Dr. Pepper beverage brand. They also manufacture a lot of other drinks you see on supermarket and convenience store shelves, including 7-Up, A&W, RC Cola, Hawaiian Punch, Vernors, and YooHoo. The group sits third in the beverage market, behind Coca-Cola and PepsiCo. They generally try to position their products as spunky outsiders. When you’re in the mood for something else, you turn to one of these drinks. For this brief article, I am going to focus specifically on Dr. Pepper, the flagship soda of DPSG. 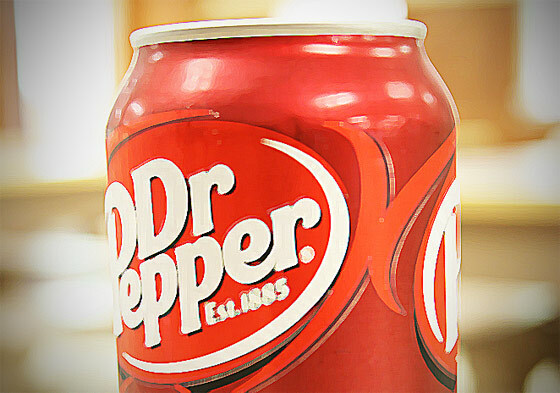 Dr. Pepper is marketed as having 23 flavors. They also like to push the idea that they are old-fashioned, using the “Established 1885″ line right on their label. But the ingredient list doesn’t clue customers in on what the 23 flavors are. Carbonated Water, High Fructose Corn Syrup; Caramel Color; Phosphoric Acid; Artificial and Natural Flavors; Sodium Benzoate; Caffeine. The dominant two ingredients are the usual formula for sugary drinks: Water and sweetner. Following that, we get caramel color to make the drink dark, and phosphoric acid which gives the mixture a sharp taste. Citric acid is sometimes used instead of phosphoric acid to achieve a similar texture. Now we get to the flavors, to the good stuff. Any idea what they are? Not a clue, except that there’s some blend of artificial and natural flavoring agents. It’s somewhat odd to see artificial listed ahead of natural in a combination statement like this, but I won’t worry about that. Rounding out the list, sodium benzoate acts as a preservative, and a 12 ounce can of Dr. Pepper includes just about 40 milligrams of caffeine, or about the same as 1/2 a cup of coffee.